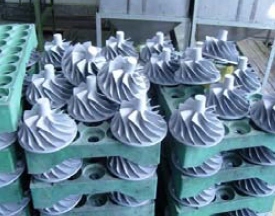 aluminum impeller, used in the cold air treatment system of turbocharger, is made by investment casting or low pressure casting process. The material is A356 T6. In our professional aluminum investment casting factory, aluminum impeller is casted strictly according to relative TS16949 quality standard. The weight is from 0.5kg to 2kg.